Make A Mini Easter Basket Craft easily with our simple instructions and downloadable printable. 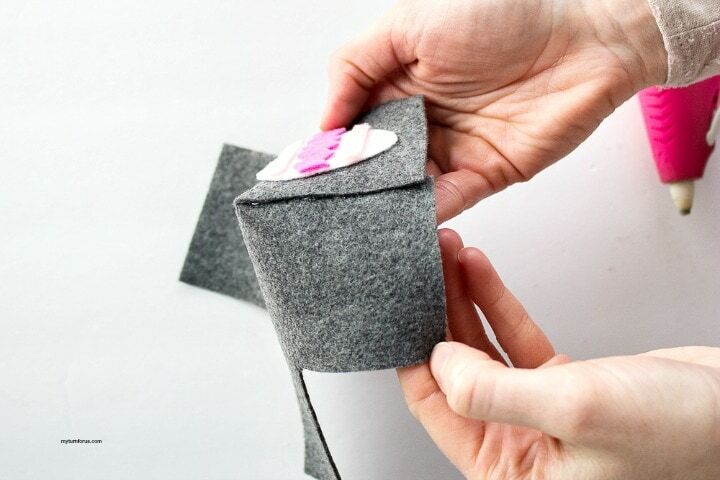 Also, this Felt Basket is an easy no-sew felt craft. 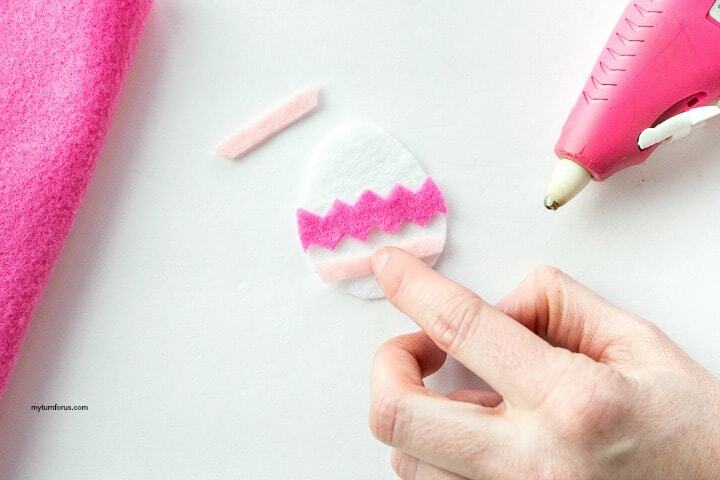 Make this no-sew felt Easter basket with your trusty hot glue gun and a few pieces of felt. 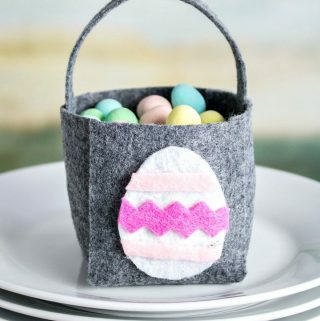 We are here with a free downloadable template, and we will talk you through these easy steps to make your felt basket or baskets. Seriously, folks, it’s just a matter of cutting out the pieces and gluing them together for this Easter Basket Craft. 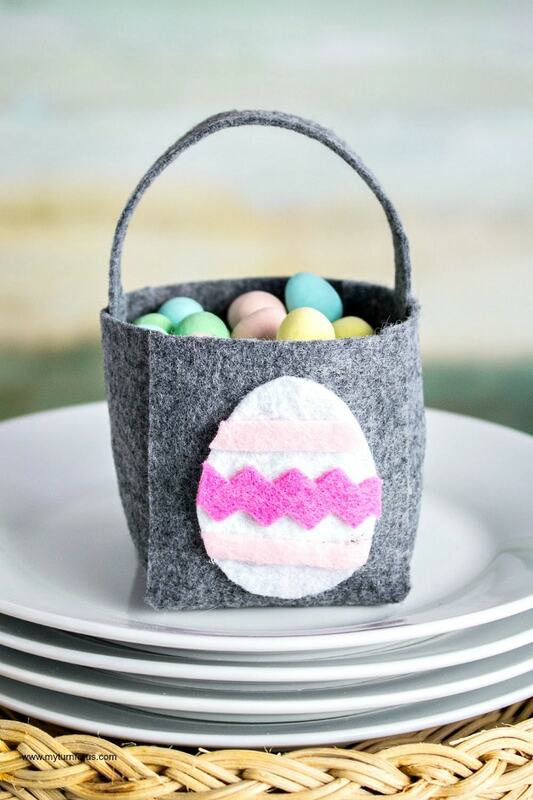 And you could easily make and display this cute little felt basket in under an hour. This post contains affiliate links which means if you make a purchase, we might receive a small commission at no additional cost to you. 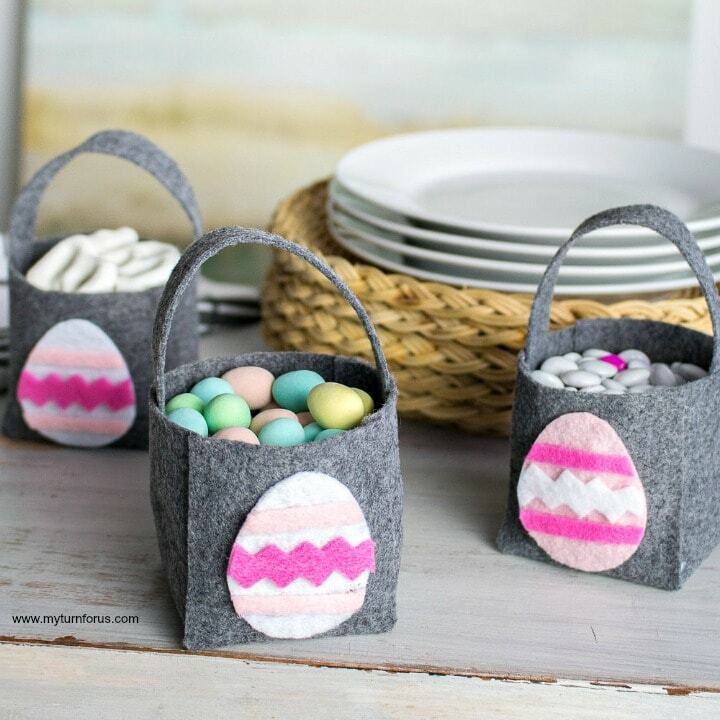 And you could fill these baskets with Easter goodies or fill them with flowers. We are planning on making some and using them for place settings for Easter Dinner. 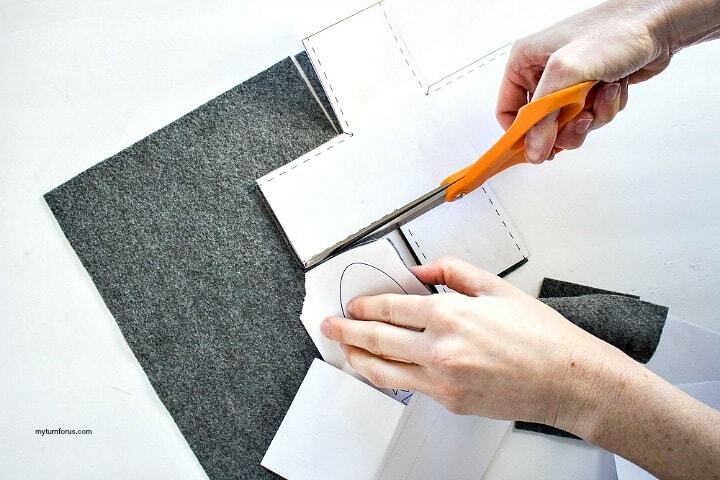 Use fabric scissors and cut the large box pattern and basket handle in charcoal felt. Clip all four inner corners of the box pattern. Set aside. 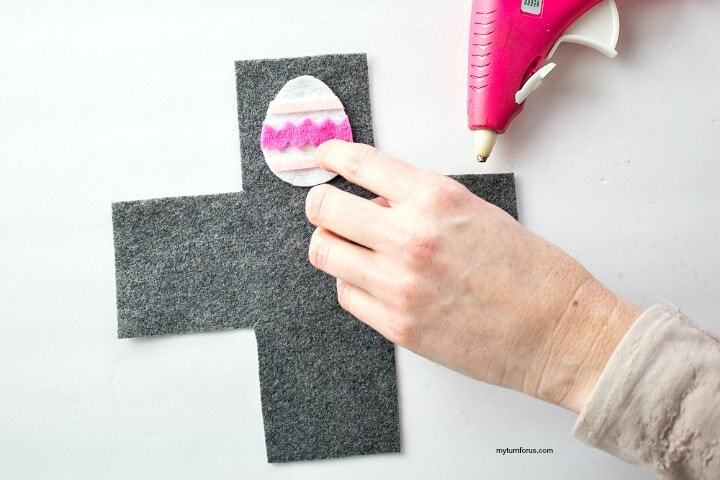 Cut out the egg pattern in white felt. Cut out the decorative pieces (stripes and zig-zag) in any color of your choosing. 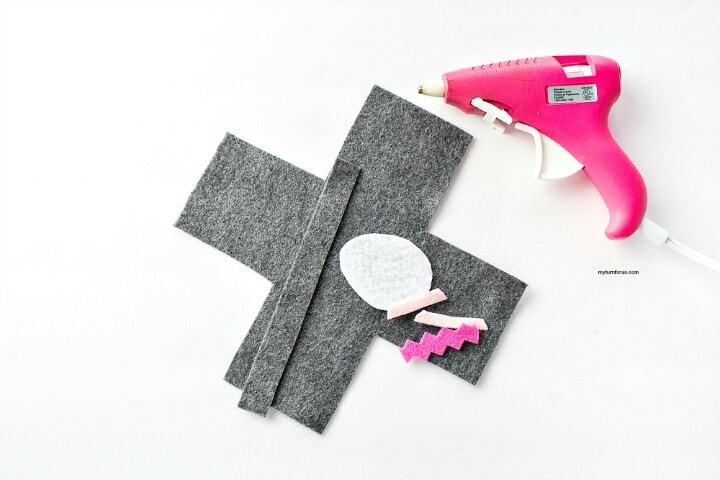 Go ahead and preheat the hot glue gun. Turn the prepared egg face down and apply glue to the back. Working quickly and carefully, press the egg onto the top section of the cut box pattern as shown. Take care to not place it too low on the one side. To assemble the box, work one corner at a time. Add a line of hot glue to one cut corner edge as shown and overlap with the other cut piece. Press together to form a corner. Repeat for remaining 3 corners. 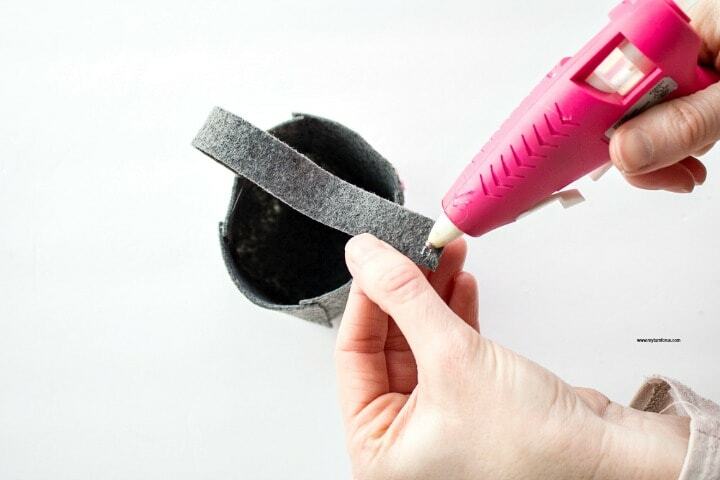 Add a bit of glue to the ends of the long rectangular piece and attach it to the inside of the felt basket to form the basket handle. Fill the finished felt basket with treats or alternatively you can fill a little plastic bag with treats and place it inside the felt basket. 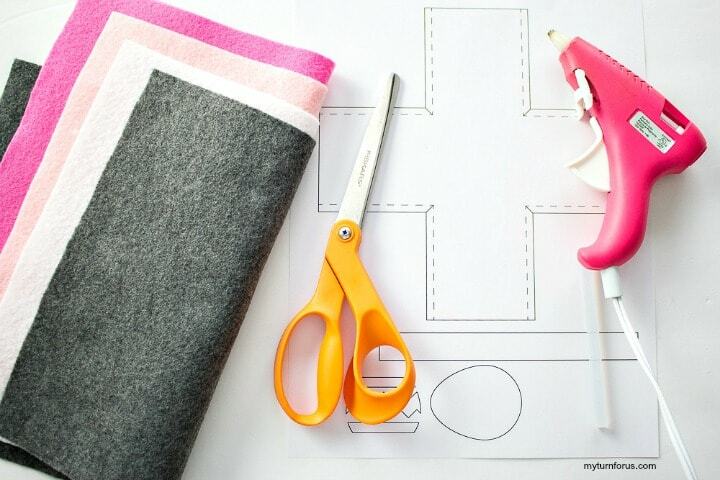 Didn’t I tell you that this was an easy no-sew felt craft? We really hope you enjoy making more of these. 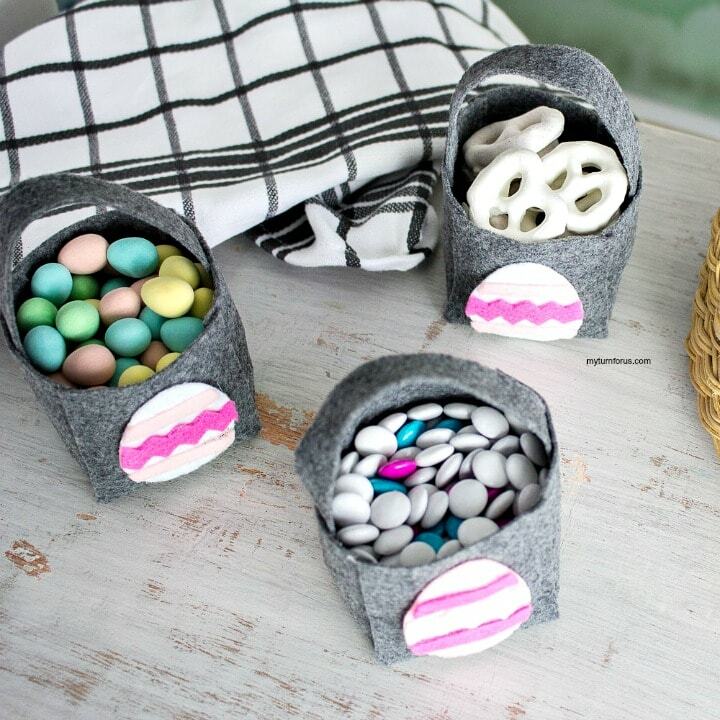 Make these Mini Easter Basket Crafts easily with our simple instructions and downloadable printable. Also, this Felt Basket is an easy no-sew felt craft. Cut out the decorative pieces (stripes and zig-zag) in any color of your choosing. To assemble the box, work one corner at a time. Add a line of hot glue to one cut corner edge as shown and overlap with the other cut piece. Press together to form a corner.